Light, Air and Open Space were the priority in developing this scheme. The open matrix was used so that daylight and fresh air can penetrate the entire program, promoting a healthy and comfortable environment for learning.The site lends itself to separating the program into two levels; the Academies are located over the shared space so that all the common uses are easily accessible from all the learning spaces.The Academies are entered from Convery Boulevard, where the bus drop off is located. Bike courtyards are integrated into the open space beside the individual academic entrances and the Instructional Commons. The Shared Space has a single entry off Chamberlain Avenue where the road elevation is equivalent to one floor lower. Parking is available from this side of the site and is arranged into one main parking lot between the support space and the auditorium. 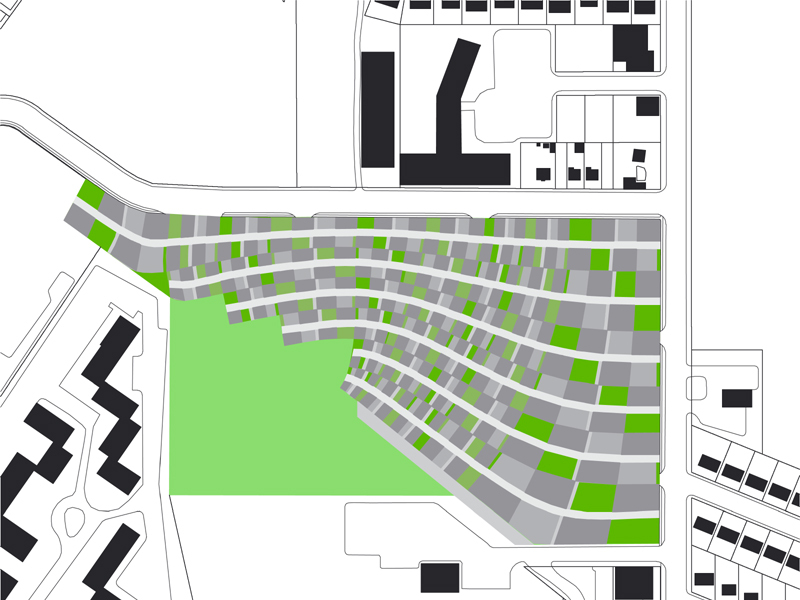 Faculty and staff parking are available throughout the site in some of the courtyards on the lower level.The open space matrix is formulated to allow, amongst other things, vehicular access across the site from Chamberlain to Dorothy Avenues for emergency vehicles.The plan/section strategy was developed on the principle of a sponge where a solid form is filled with individual outside spaces. 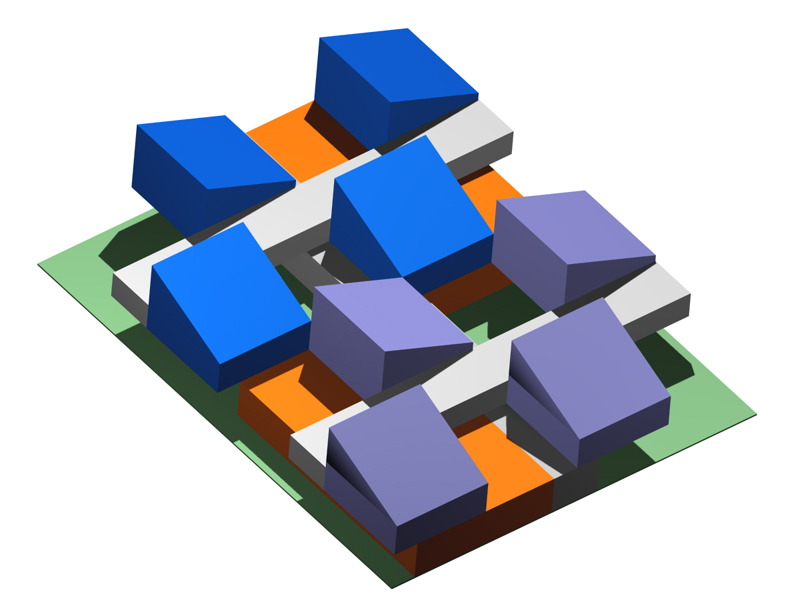 A typical plaid layout was adopted to integrate the program with this spatial model. The plaid took on layers that were derived from the site’s elevations so that the plaid became 3 dimensional. 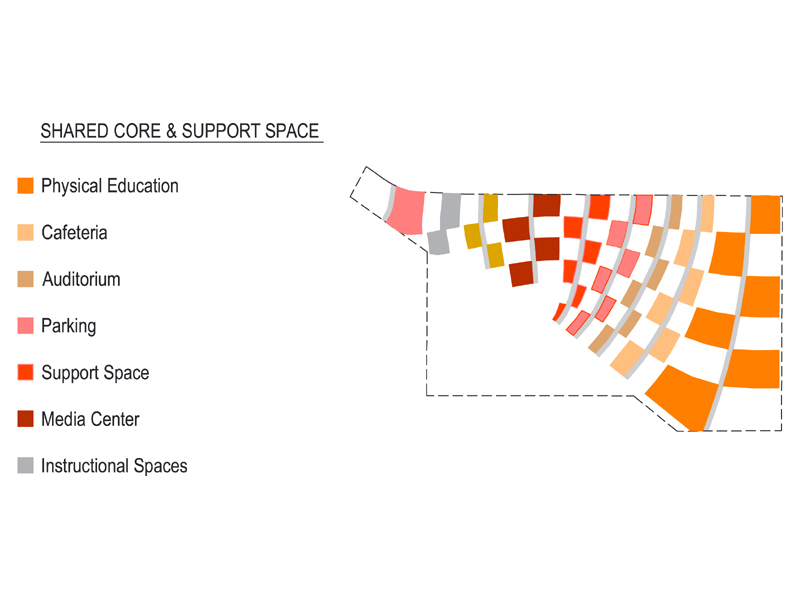 The differential scale of the two types of space (the Academies and the Shared Space) permitted the plaid strategy to function so that light and air can penetrate through the academies to the courtyards of the shared space below, while allowing 50% of the open space at the academies level to be used as outside space. When this idealized spatial model is applied to the site, the directionality of the circulation is fixed. Since the upper floor, the Academies, is entered from Convery Boulevard, the circulation runs North/South. On the Shared space floor the circulation is East/West. The School Within a School, which doubles as community space, is located along Chamberlain Avenue. A less obvious boundary to the site is the State Highway Storm Easement. This edge establishes a limit to contain the program/open space matrix. The remainder of the site, approximately 30% is used for sporting activities and connected directly to the community via Chamberlain Avenue. 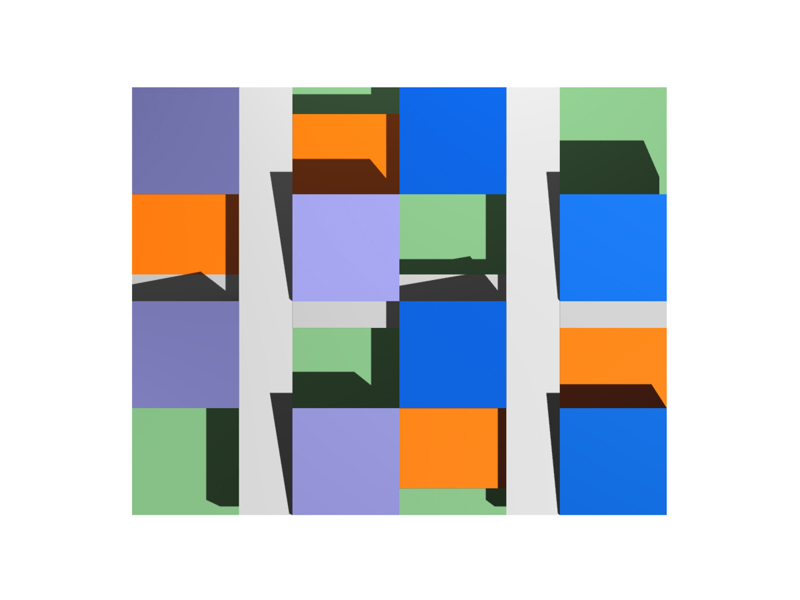 The storm easement causes a pinching of the geometric matrix creating a warping of the grid. This suggests that this grid formula could be fitted to other geometric configurations and sites. 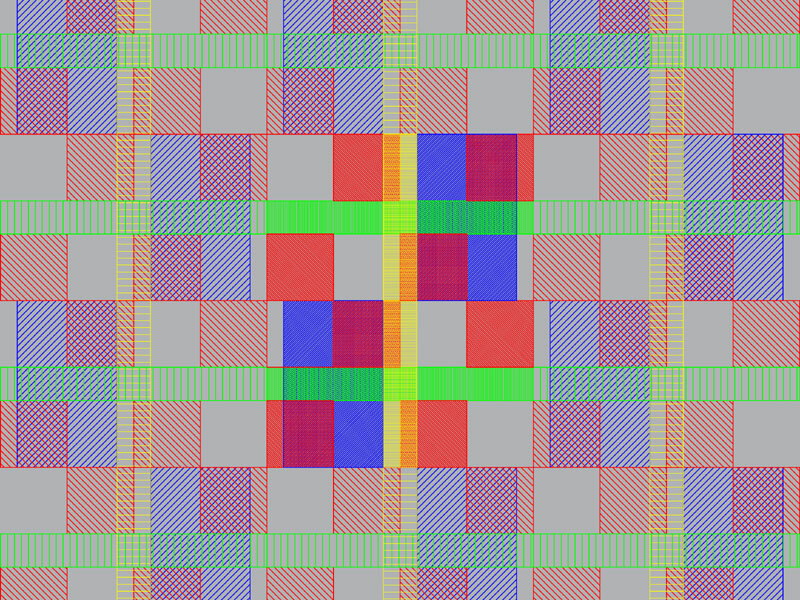 The method used for program distribution was to use gross areas multiplied by the open space that the 3D plaid system dictated. 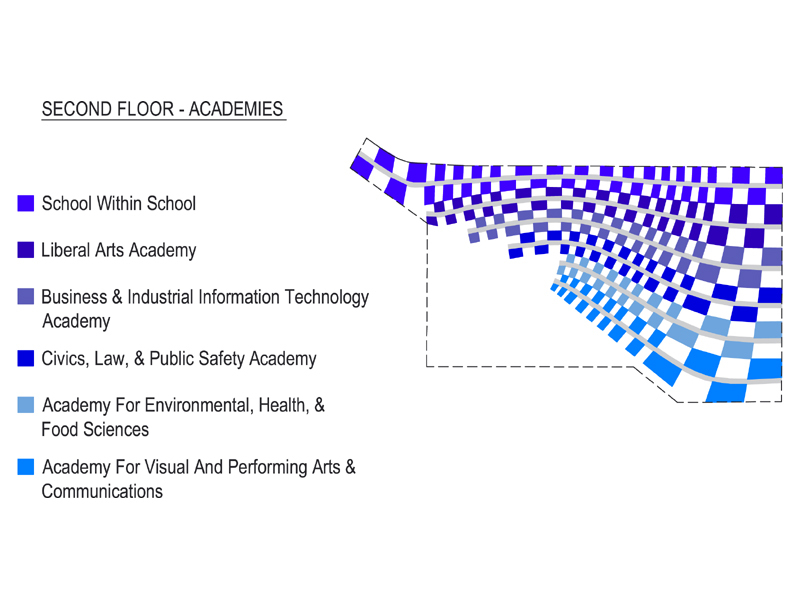 So the shared space is multiplied by 200% and the academies are multiplied by 175%. The open spaces are used primarily for outside learning spaces, gardens, physical education and community programs. Circulation within the high school complex is seen as much needed exercise. Sitting for long periods requires periods of activity so the long corridors and multiple stair connections are a method of exercising. To move from one academy to another the lower level must be used. So it is easy for faculty and staff to do this, but it will encourage separation between the students from each school. The open space strategy is primarily aimed at improving the learning environment by increasing the student’s exposure to our natural environment (Light and Air), while reducing energy and equipment costs associated with artificially lighting and conditioning the space. The multiple courtyards will allow cross ventilation and sunlight into the outside and inside space throughout the school day.